With St. Patrick’s Day around the corner, the notion of luck is everywhere, from winning the lottery to finally finding a four-leaf clover. For many, luck is just another word. However, for business owners, luck isn’t something that should be relied upon, especially when it comes to employee usage of HR tech. Studies show that when employees engage with HR tech and enter their own information, businesses save time and money, not to mention increase productivity and retention rates within their organization. And with millennials not just expecting – but demanding– up-to-date tech in their workplace, it’s time to ensure your employees understand and utilize the tech provided to them. Here are four tips and resources to encourage employee usage of your company’s HR tech — lucky pennies and rainbows not included. According to Pew Research Center, 95% of today’s Americans own a cellphone, 77% of them being a smartphone. Although the thought of using smartphones at work once was forbidden, they allow people to solve problems and engage with others, while serving as the perfect vehicle to deliver HR tech. Apps let employees receive important updates and make changes on their device, and thanks to Paycom’s mobile app, that now includes HR updates. Putting the power of modifying essential workplace data into your employees’ hands not only engages them, but takes HR out of the middleman spot, giving those professionals more time to focus on strategic initiatives that align with your business’s mission. The digital transformation has turned the workplace from ordinary to innovative, yet some companies still adhere to a “business as usual” mindset. Implementing single-application HR software can improve employee productivity and mitigate the cost of relying on dated, manual processes. 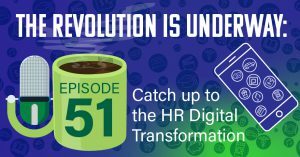 Listen to this episode of the HR Break Room podcast, as Information Age content editor Nick Ismail gives actionable ways businesses can ditch their old tech and embrace a new, single-app solution. When businesses stick to manual processes and prevent employees from using HR tech, they lose time and money. And exactly how much money is now determinable. Ernst & Young, one of the world’s leading professional services organizations, recently released its findings regarding exactly how much companies lose when HR tasks are completed manually. 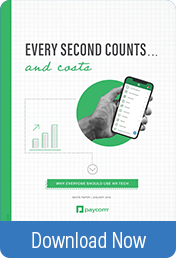 For all 41 tasks measured, the average cost per point of data entry is $4.39, while more common manual processes – like benefits and I-9 forms – cost even more. There’s no better time than now to automate your HR tasks. Discover the exact figures and implications in this white paper. Onboarding sets the stage for new hires and allows businesses to create a favorable first impression. Now, you can set a precedent for HR usage with self-onboarding as well. According to the Ernst & Young study, the processes of onboarding, training and benefits enrollment provide the highest opportunity for saving money through self-service tech. Self-onboarding allows employees to enter their own information remotely, increasing data accuracy. And without new-hire paperwork on their first day, they can be productive from Day One. These can be tedious tasks, especially for the busy HR leader who does not know new employees’ information as intuitively as employees do. Discover more reasons why new hires should self-onboard in this blog post. Luck of the Irish may be on your side during your next coin flip, but ensure your organization is equipped with automated, single-application HR technology to increase and encourage employee usage within your organization.